Developers have found clever ways to advertise brands in the games we play. Last year, we discovered that Sim City Social featured a Dunkin Donuts building that was much, much better than the normal bakeries in the game. So much better that a smart, savvy player will likely exhibit brand loyalty to Dunkin Donuts because it grants them an in-game benefit. 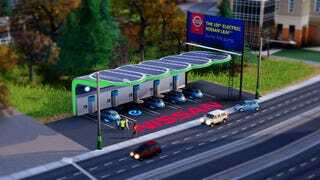 Something similar to the Dunkin Donuts advertisement is back now in the first free DLC for SimCity according to PC Gamer: a Nissan Leaf® Charging Station. A community manager on the SimCity forums explains that the item provides "happiness to the Sims that use it and a onetime wave of happiness to the nearby businesses" along with the bonus of producing no sewage or garbage. 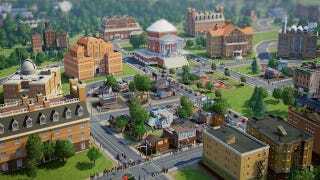 It also "will not take power, water or workers away from your city," and after using it, "players will start seeing a percentage of their Sims from all wealth classes driving the electric vehicles." If this is an item you want, you can download it here. The Nissan Leaf® will only be available for six months, starting today, but note that PC Gamer noticed that the trade-off is that you can see the Nissan® logo at most zoom levels, which makes sense. It's an advertisement, after all.